On my return to Cyprus, from my studies in London, U.K., in 1985,I started working as a Professional Psychologist, Speech Therapist and Alternative Medicine Practitioner (Reflex Zone Therapy)- combining my expertise in Diagnostic Therapy, according to the Needs of People of all ages. I set up my private practice as “Kartherina Therapy Centre” that developed into “Life Guidance Today” and “Coaching to Solutions”. I have been working for 33 years now with individuals from 1 to 97 year old and their families – from all over the world -, small and bigger Groups of various ages and Specific Needs and the development and organization of the Youth and the Society. I worked with all kinds and levels of Low and High IQ as well as Talented and Handicapped Individuals and Groups. I have always been working into/towards the Best Solution of the Individual, the Family, the Society, believing in Everybody’s Capability to Know, to Understand in different ways and to Develop the Best for Them and their Society. This reflects in all of my Work as a Professional Therapist, Consultant, Director, Supervisor, Trainer, Multiplier of Change and Development, YouthWorker, Coach, Mentor, Project Developer and Organizer. As such I have developed all Therapy, Training and Coaching Methodologies I have been using further and into New Methodologies and Tools of Learning, in a number of cases (e.g. “PROKOP” Practice, “The Past-the Present- the Future”, “SYN+HORO”, “HEY-CESS- Humanitarian Education YouthWork in Crises and Extremism Situations and Societies”, “Humanitarian Education YouthWork”, “Body Empowerment”). I have never accepted Formal Education as being the only or the best way of learning and developing Capabilities and Wisdom. In fact, I found myself working in/through Non-Formal Learning/Education, Life Long Learning, YouthWork and Humanitarianism, even before some of these terms were officially brought up and have enjoyed every moment of it with all the ups and downs, naturally developing when working with Youth and the Society, especially when working with the Adults and the Society, to recognize the Presence, the Qualities, the Capabilities, the Wisdom of Youth and the Position they could/should have in Society at all levels, for the Best of All and of the Society. A main part of my work, of course, has been and is working as an Informal Non-Governmental Organization (NGO) working with PEOPLE IN INEED. I founded and developed The Counselling Station «Apofasi-ZW» (Decide to Live) in 2012, in Nicosia (with the support of the Greek Orthododox Archbishopry of Cyprus and the Integrative Psychotherapy Institute), which started with an approved Therapy Program from The Cyprus Antidrug Association, on Drug Addiction and Addiction of Legal and Illegal Substances and Behaviours. Among my Volunteering experience, Ι worked as a Professional Expert with the Cyprus Red Cross (with Refugees, Migrants and Cypriot people and families), the IFRC-International Federation of the Red Cross and Red Crescent Societies (developing Humanitarian Education YouthWork), the Holy Mitropolis of Kyrenia (developing local projects on specific groups and society reorganization and development), The Greek Orthodox Church Mission in Zimbabwe. Ekaterini Prokopiou was born in Nicosia, in Cyprus. She studied at the English School in Nicosia, as Secondary Education. Ηer first studies were at The City University- London, in England. She has two angels in her life – her children- Andreani, an Architect and Interior Designer and Charles an Accountant Advisor, discovering life and their talents in life further. Ekaterini enjoys working with people of all ages and particularly working with and for the Youth. She felt pretty “stupid” a number of times working with 5 and 7 year old Youth, admiring their wisdom and awareness and acknowledges that all Youth can Know much more than a lot of Older Adults, because this is Their Life and Their Society and they always have lots of awareness and wisdom – it is up to the each individual adult and the society to recognize all these gifts the Youth can offer in life boundfully. When not working, or doing voluntary work, Ekaterini enjoys peaceful times and serenity in nature and monasteries in Cyprus, Greece and England. She enjoys drawing with pencils and chalk-pastel colours and on a number of times was shocked and amazed at what develops into beautiful pictures and expression. She enjoys writing and can be pretty good at it. 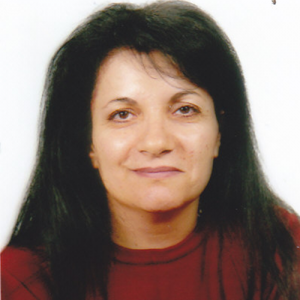 Despite her handicap experiences at many points of her life, Ekaterini has been helping/supporting people all her life and doing lots of voluntary work in Cyprus and abroad, to the point that she has been :”suffering” financially for a number of years now. “The smile and the shining glimpse in the eyes of these children was worth it”, but life has a lot of financial responsibilities as well. Training is always very enjoyable and rejuvenating for Ekaterini for many years now and she always has something to share with others, but also a lot to learn from Everybody, no matter who they maybe or how old they maybe. Wisdom and learning starts much before the birth and does not stop developing even after death. After all this is Life Long Learning and Non-Formal Learning and Education, as well as Being a Humane Human Being, which Ekaterini hopes she is and is a Multiplier of as well…..
Η Αικατερίνη Προκοπίου γεννήθηκε στην Λευκωσία, στην Κύπρο. Φοίτησε στην Αγγλική Σχολή, Λευκωσίας, Επίπεδο Γυμνασίου-Λυκείου. Οι πρώτες της σπουδές ήταν στο City University του Λονδίνου, στην Αγγλία. Έχει 2 αγγέλους στην ζωή της – τα παιδιά της – την Ανδρεανή, Αρχιτέκτονα και Διακοσμήτρια Εσωτερικού Χώρου και τον Χαράλαμπο, Λογιστή Σύμβουλο, που ανακαλύπτους την ζωή και τα ταλέντα τους στην ζωή παρακάτω. Η Αικατερίνη απολαμβάνει την εργασία της με ανθρώπους όλων των ηλικιών και προπαντός την εργασία της με και για τους Νέους. ‘Ενιωσε αρκετές φορές αρκετά “ηλίθια”, εργαζόμενη με 5 και 7 χρονών Νέους, θαυμάζοντας την σοφία και την αντίληψη, ότι όλοι οι Νέοι Ξέρουν πολύ περισσότερα από πολλούς Μεγαλύτερους Ενήλικες, γιατί αυτή Είναι η Δική τους Ζωή και η Δική τους Κοινωνία και πάντα έχουν πολύ μεγάλη αντίληψη και σοφία – εναπόκειται σε κάθε ένα ενήλικα και την κοινωνία να αναγνωρήσει τα δώρα που προσφέρουν οι Νέοι στην ζωή τόσο απλόχερα. Όταν δεν εργάζεται η δεν κάνει εθελοντισμό, η Αικατερίνη απολαμβάνει την ειρήνη και την γαλήνη στην φύση και σε μοναστήρια στην Κύπρο, την Ελλάδα και την Αγγλία. Απολαμβάνει την ζωγραφική με μολύβια και κιμωλίες παστέλ και πολλέ φορές έπιασε τον εαυτό της να σοκάρετε και να θαυμάζει αυτό που δημιουργείτε ως μια όμορφη εικόνα και έκφραση. Απολαμβάνει το γράψιμο και μπορεί να είναι αρκετά καλή σε αυτό. Αντιθέτως των εμπειριών αναπηρίας της σε πολλά σημεία της ζωής της, η Αικατερίνη έχει βοηθήσει/στηρίξει ανθρώπους στην ζωή της και έχει κάνει εθελοντική εργασία στην Κύπρο και το εξωτεερικό, στο σημείο που “υποφέρει” οικονομικά τα τελευταία χρόνια. «Το χαμόγελο και η λάμψη στα μάτια των παιδιών το κάνει να αξίζει πολυ”, αλλά, η ζωή έχει και αρκετές οικονομικές ευθύνες. Η Εκπαίδευση (Training) πάντα ήταν απόλαυση και αναζωογόνηση για την Αικατερίνη για χρόνια τώρα και πάντα έχει κάτι να μοιραστεί με τους άλλους, αλλά και να μάθει από τον Κάθε Ένα, όποιος και αν είναι η όσο χρονών και αν είναι. Η Σοφία και η γνώση/μάθηση ξεκινά πολύ πριν την γέννηση και δεν σταματά να αναπύσσεται και πέρα από τον θάνατο. Έτσι και αλλιώς, όλο αυτό είναι Δια Βίου Μάθηση και Μη Τυπική Μάθηση, καθώς και νάσαι Ανθρώπινος Άνθρωπος, που η Αικατερίνη ελπίζει να είναι και να το μεταλαμπέβει αυτό σε πολλούς άλλους.